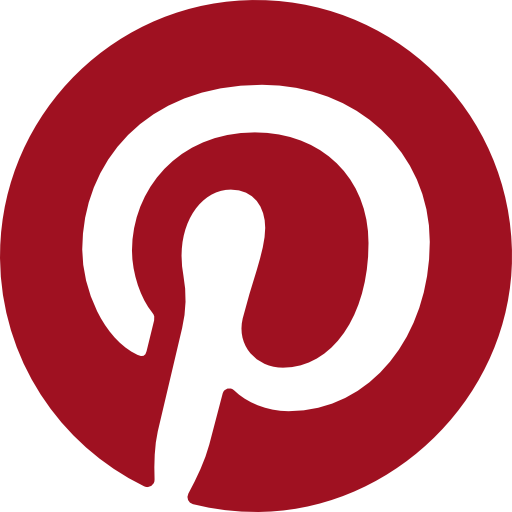 Bridal Sets There are 39 products. Artfully embellished with a sprinkling of moonstone and genuine Swarovski crystals, the Adriana White Pearl Wedding Choker & Earrings Set will lend a touch of romance to your wedding day. Combining an eye-catching Pearl and Crystal Wedding Bracelet with matching Pearl Stud Earrings, this Assorted Pearl Bridal Jewellery Set will appeal to glamorous bridesmaids and brides. Designed to add a touch of pizazz to your bridal ensemble, this Assorted Pearl Wedding Necklace and Bracelet Set sparkles from every angle. Perfect for beachside weddings and outdoor receptions. 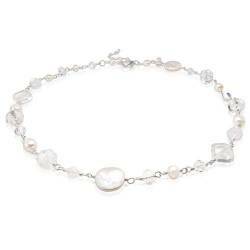 Handmade and styled to complement both modern and traditional wedding gowns, this Bridal Pearl and Swarovski Crystal Necklace and Bracelet Set is understated, elegant, and effortlessly beautiful. Affordable luxury for brides on a budget, the Cassio Pearl and Crystal Wedding Jewellery Set includes a stunning pearl and crystal necklace and matching earrings. The perfect gift for bridesmaids. The epitome of understated glamour, the Keimau Pearl and Silver Bridal Jewellery Set proves that less really is more when it comes to modern handmade wedding jewellery. The Mama et Moi Rosaline Pearl Bridal Set includes two identical necklaces, one for adults and a smaller version for little girls. The perfect duo for brides and flower girls. From our exclusive Mama et Moi Collection, this Rosaline Silver Heart Bridal Necklace Set with Pearls and Crystals is perfect for brides, bridesmaids, flower girls and mothers of the bride and groom. Designed to complement so many special occasions, the Mama et Moi Pearl and Gold Heart, Pearl Wedding Necklace Duo is the perfect jewellery gift set for brides, bridesmaids and flowergirls. Created for mothers and daughters, the Mama et Moi Pearl Star Wedding Pendant Set includes two matching necklaces for your wedding day, Mother’s Day, and everyday wear. The perfect gift. Modern and beautiful, the Mama et Moi Rose Gold and Pearl Wedding Pendant Set is an exceptional piece of bridal jewellery for mothers and daughters. Includes two matching white pearl necklaces. With its eye-catching display of sterling silver and bridal white pearls, this Mama et Moi Wedding Pendant Set will lend sophisticated shimmer to your wedding day. A mother and daughter delight. If you are looking for the perfect mother daughter gift for your wedding day, look no further than the Mama et Moi Pearl Wedding Pendant Set with Silver Stars. 2 pearl necklaces, one stunning design. Sometimes, a simple Wedding Necklace and Earring Set is all one needs to complete their dream wedding day look. The Rosaline Bridal Set includes both, with shimmering pearls and handmade hearts. 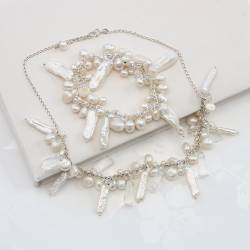 Modern, majestic, and made to last a lifetime, the Octavia Quartz Point Wedding Necklace and Bracelet Set is an exceptional piece of jewellery for brides who like to stand out in a crowd. 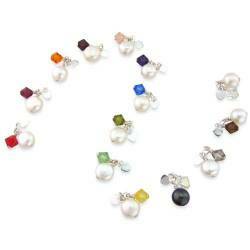 Treat your bridesmaids and flower girls to this Personalised Birthstone Silver Charm Disc Wedding Necklace and Pearl Stud Earring Gift Set. The perfect duo for wedding celebrations. Designed to bring a pop of colour, character, and customised charm to your wedding day, this Personalised Birthstone Heart Charm Wedding Set will make a stunning gift for bridesmaids. 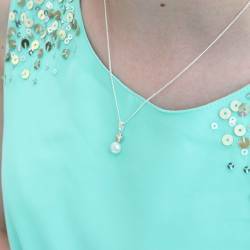 Personalised bridesmaid’s gifts, such as this Birthstone Crystal and Pearl Charm Wedding Necklace and Earring Set, are the perfect choice for larger bridal parties. If you are looking for personalised bridesmaid gifts to complement your wedding colour scheme, look no further than this Personalised Wedding Charm Necklace and Earring Set with Swarovski crystal. Customisable with a choice of options to suit every member of your bridal party, this Personalised Heart Charm Wedding Necklace and Earring Set is the perfect gift for bridesmaids and flower girls. A symbol of love, friendship, and making memories together, this Personalised Letter Charm Wedding Necklace and Earring Set will delight your bridesmaids and flower girls. Adored by traditional brides for its modern styling and timeless appeal, this Personalised Silver Cross Wedding Necklace and Earring Set is the number #1 bridesmaid gift choice. Part of our best-selling mix and match bridal jewellery collection, this Personalised Tag Charm Wedding Necklace and Earring Set is just perfect for modern brides, bridesmaids and flower girls. Enriched with hearts, crystals and pearls, the Rosaline Silver Heart Swarovski Wedding Jewellery Set is timeless, romantic, and effortlessly beautiful. Bridal necklace and matching earrings included. Adored by brides, bridesmaids and flower girls for its romantic styling and timeless appeal, the Rosaline Silver Heart Wedding Necklace and Earring Set is the epitome of understated glamour.